Orca spend a lot of time cruising the shore off Northern Vancouver Island in British Columbia where they find a lot of tasty meals. Sunset is a beautiful time to be whale watching as the light from the sun makes the water glisten off the dorsal fins of the Orca and the mist from their blow holes shimmer above them. These male Orca are cruising their way through the calm ocean waters off Northern Vancouver Island towards the shore where they may either do a little fishing or continue cruising. Orcinus Orca are the biggest member of the dolphin family and one of the most majestic sea mammals to watch. 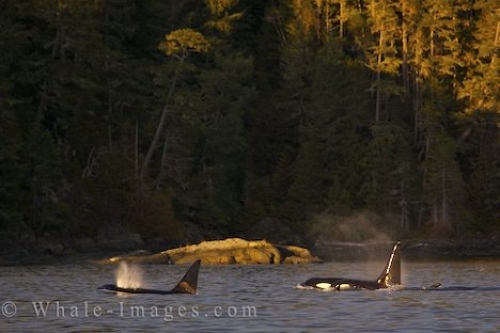 The Orca can usually be found cruising the waters off Northern Vancouver Island during the summer months anywhere from Port Hardy right down to Campbell River. ... Often the Orca will be in the Robson Bight Ecological Reserve in Johnstone Strait where they love to rub their gigantic bodies on the rocks along the shore. If Orca cruise into Robson Bight, then your whale watching is done from outside the boundaries unless you are lucky enough that another pod comes cruising by.